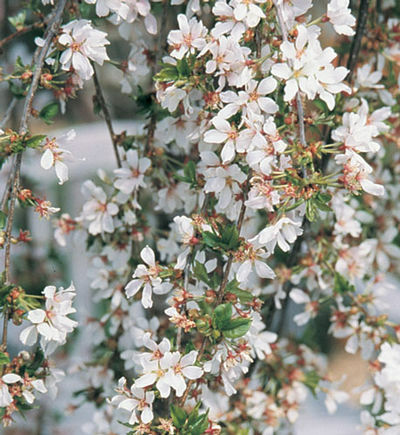 Snow white flowers emerge along the cascading branches that reach the ground in early spring. A perfect specimen for small gardens, patios and court yards. Nice green foliage in summer give way to hues of yellow to orange in the fall. We offer Snow Fountain 1" to 1 1/2: caliper, 6' tall in a 20 gallon container. Slow growing, ideal for small spaces. Fertilize in spring with an all purpose fertilizer before new growth begins. Prune after flowering to maintain it's shape when necessary.